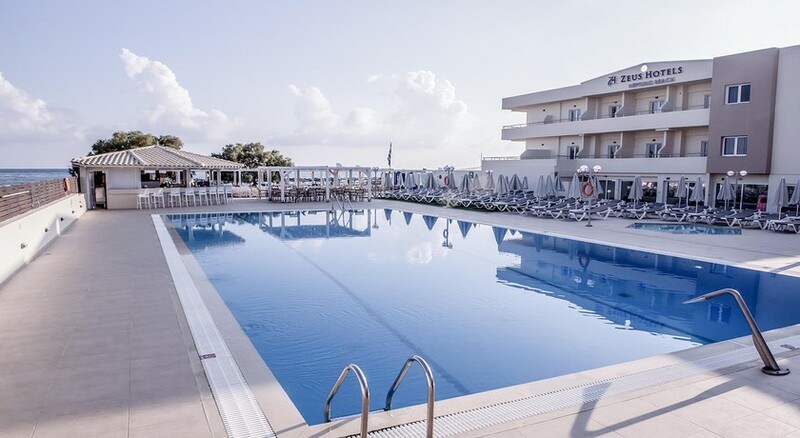 The Mareblue Neptuno Hotel is beautifully situated on 9 km of sandy beach in the traditional resort of Ammoudara on the island paradise of Crete. Offering countless opportunities to enjoy organized activities, sport and leisure facilities or simply just relax, this 4 Star All-Inclusive retreat has 136 comfortable guestrooms surrounded by delightfully landscaped gardens. 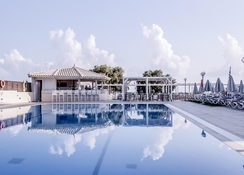 Guests to the Mareblue Neptuno Hotel can discover marvellous beaches and sleepy villages along with a wide array of shops, restaurants, traditional tavernas, lively nightlife and attractions in nearby Heraklion. N. Kazantzakis Airport is 11 km from the hotel. Facilities include an outdoor swimming pool with surrounding sun-terrace furnished with loungers and umbrellas. Further leisure facilities include table tennis, billiards, beach volley, French bowls, darts and pool aerobics. For children there is a kids-club, mini-disco and playground. The animation team provides a full day and evening entertainment program for both adults and children with sports, shows and competitions. There is also a pool snack bar, a lobby bar and a buffet restaurant. Guest services include 24-hour reception, currency exchange, TV lounge, luggage room, Wifi internet access, laundry service, babysitting, doctor on call and car rental. Pool and beach towels are available free of charge, against a refundable deposit. A total of 136 guest rooms, consisting of standard doubles, double rooms with side sea view and open plan family rooms. Family rooms can accommodate up to 2 adults and 2 children with a double bed and a bunk bed, while double rooms can sleep up to 3 people. Standard room facilities include an ensuite bath/shower-room, tea and coffee making facilities, air-conditioning and heating, hairdryer, slippers, mini-fridge, satellite TV with radio channel and hotel information channel, direct dial telephone, Wifi internet access and a balcony or terrace. A safe deposit box is available to hire for a local charge. The All Inclusive programme includes all meals; breakfast, lunch and dinner served buffet style in the main restaurant. During meals drinks are self service and include local beer, white and red wine, soft drinks and juices. A choice of snacks are available throughout the day at the pool snack bar, coffee and cakes is served from 4pm to 5pm, and ice-cream is available from 10.30am until 11pm. A selection of locally produced alcoholic and soft drinks, as well as some brand name spirits are available from 10am to 11pm. Additional charges apply for Wifi internet access, safe deposit box, babysitting, medical assistance, laundry services, car rental, billiards and watersports. The Neptuno Mareblue Beach is located at the beginning of Amoudara''s long stretch of sandy beach. Within easy reach of local shops, bars and tavernas, and only 4km from the old city walls in Heraklion. There is a local bus stop situated 20 metres from the hotel that provides easy access to other areas of the island. Heraklion Airport is approx 9km away. This is our 6th visit. That says it all. Staff are very friendly and helpful. Buffet has lots to choose from. Special diets are catered for. Beds are very comfortable. This hotel has recently been refurbished and the walk in showers are amazing! Lots of sunbeds available around the pool and on the adjacent beach. Free wifi throughout with very good reception. Entertainment has been upgraded and a big sucess. Shops are approx 15-20 min walk away or bus at top of street.